I have a wonderful and extremely patient husband who lets me chase after all my random dreams and hobbies. We have two daughters who are two of the best things to ever happen to me, two cats, two gerbils, a frog, loads of fish, and a cool dog named Rudolph who we trained to be a therapy dog. Currently, Rudoplh and I visit a hospice facility once a month and do PAWS to read at my library whenever we can. I LOVE going places and seeing new things! No adventure is too small for us. We usually spend our weekends at local museums, but love day trips to fun and unusual places near where we live. 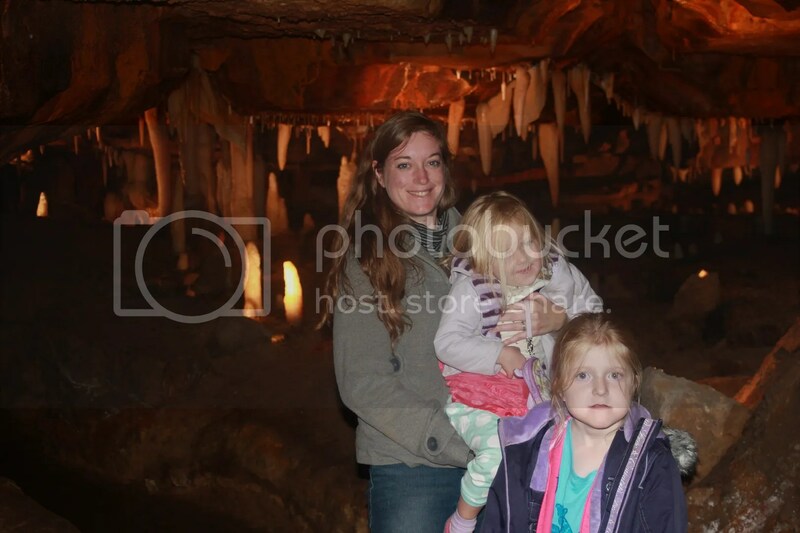 For instance a while back we went to the Ohio Caverns. It was a bit of a drive but totally worth it! I really want to go back! with my girls 100 feet below ground, despite their deer in head lights look, the girls really did enjoy this experience. Especially the gem stone mining station above ground! I graduated with my masters degree in library science in 2011, after spending 6 years on a 2 year degree. I took my time and had two babies so honestly, I’m just glad I managed to actually finish it! I also design and sell digital scrapbook kits in the evenings, after the girls go to bed, and any other time I can squeeze in during the day. I totally love scrapbooking and I think it goes along with genealogy so well. What better way to share all these amazing findings and all my hard work with the rest of the world than in a beautiful scrapbook page! I’ll be sharing many of the pages I’ve made about my ancestors on this blog. I’ve been into finding out more about my family tree for the last few years and have been tracing lines in both my family as well as my husband’s. You can read about how I started being interested in genealogy in my first post on this blog about my Great-great grandfather Gustav. There have been many interesting discoveries along the way and some frustrating difficulties as those ancestors play hard to find. Dang Murphys! I teach genealogy classes at the library where I work (I’m normally a part-time children’s librarian, however and do storyimes, American Girl doll programs, art classes, and even digital scrapbooking for adults). I hope to leave my girls with this amazing family tree, filled with documents, photos, and wonderful stories that help bring their heritage alive and help them better understand where they come from and give them an appreciation for where they are going. Harllee.You have some great family information. I see you have a passion for tracing the Hibbs line and I was wondering if you could help me? I am searching for the remainder of direct lineage circa 1660. I am guessing our branch sprung to Australia from one of the remaining sons of William Snr/ William and Joanne(Joan)…etc. I have below the line to 8th Gen, but would be ever grateful if you could help? I’m sorry, I have only been focusing on our family’s direct ancestors and haven’t focused on other branches. I looked online a little at the other children of William Sr. and Joanne and couldn’t find a reference to any of them moving to Australia. I’m sorry I don’t have any more info on this part of the family. Good luck in your searches! Thanks Meghan, I do appreciate your efforts. The mystery remains, for now! As I’m certain around the time of 1687, part of the family migrated to America. My link would be with the part of the family which stayed in England. My husband just purchased a photo of Edward Roessler. Written on the back is, Grandfather Edward Roessler Captain- Mexican War. Edward is in military uniform, seated, and holding a sword and gun. Any interest? Let me know. Yes! I would love to see this photo. I sent you an email at the email address tied to your comment. This is very interesting. I am a Miller. Several years ago a relative contacted my family to tell us that she was writing a family history of the Millers. I have 2 of the volumes of that history. One covers all descendants of John Christopher and Hanna Stratman. The other is devoted to the descendants of his son, John Martin. The book was published in 1985 by Katherine Borchers Cotner – Library of Congress number 85-81782. Copies at that time were available by contacting Mrs. Carolyn Gerard 3603 S. Beechgrove Rd. Wilmington, OH 45177. There are some differences in her records and yours. I have put some of the info into a software program – Family Tree Maker. I could send you that info if you give me your email address. The two books have about 600 pages in total, so I’ve only put in a small amount. Nice to be in contact with another cousin. I live in Beachwood, OH. Thank you so much for the article. Robert Hogsett ( I am so far down the line from this man), but I really appreciate you. My grandparents had the Hogsett and Sons Feed Mill in Uniontown.